Kids can make a big batch of this hearty organic stew in the winter because it tastes even better the next day! The aroma of stew cooking on the stove makes the whole house feel cozy and warm. This s is nutritious and filling, rich in protein, fiber, and essential vitamins and minerals. 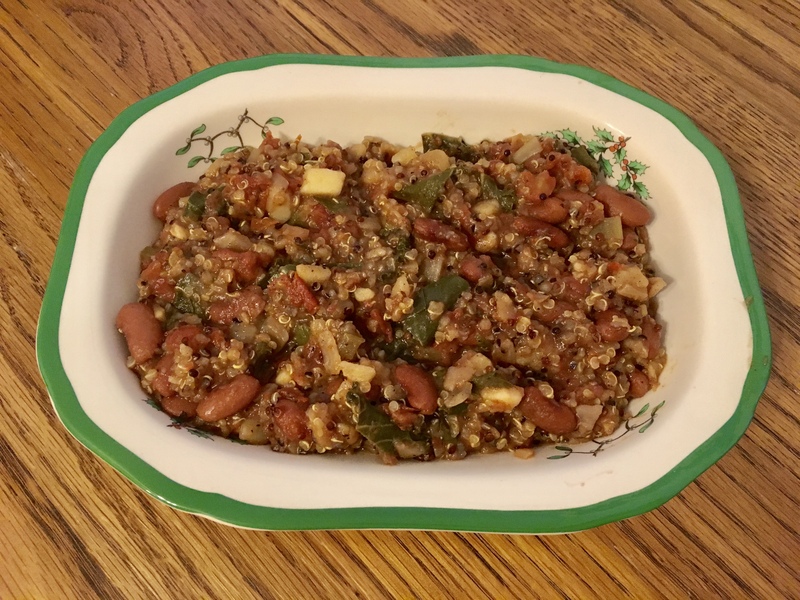 Kids can use Cajun spices, organic red kidney beans, organic sweet potatoes, and quinoa to create this flavorful stew. Beans have traditionally been used in New Years soups, as they are healthy, hearty, abundant, inexpensive, and rich in protein and essential nutrients. Kids can soak ½ cup of organic red kidney beans overnight. Cover the bottom of a pot with the juice from an 14 oz can of organic tomatoes with green chilies. Add ½ cup of chopped organic red onion, ½ chopped organic green pepper, 1 chopped organic celery stalk, and 1 minced organic garlic clove and cook for 3 minutes until the onion is soft. Drain the kidney beans and add them to the pot with one chopped organic (white inside) sweet potato, the rest of the can of organic tomatoes, 1 cup veggie broth, and 1 ½ cup pure water. Bring it to a boil, reduce heat, cover, and simmer 1 hour until the beans are tender. Kids can pour the blended broth back into the pot and add ⅓ cup of organic quinoa, 1 cup of chopped organic mixed greens (kale, chard, collard), 1 sprig chopped fresh oregano, 1 sprig minced fresh thyme, 1 tsp paprika, ½ tsp sea salt, ½ tsp cinnamon, dash black pepper, and cayenne pepper. Return to a boil, cover, and simmer for 25 minutes. Kids can freeze left overs in a glass jar, leaving 1 ½ inch at the top for it to expand.